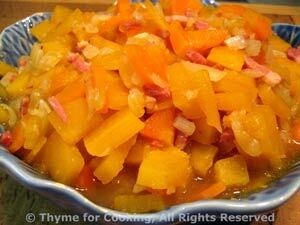 Rutabagas, Carrots, Bacon, Onion, Thyme for Cooking fall vegetable sides. Rutabagas, or Swedes as they are known in the UK, are a yellow turnip. They add sweetness to vegetable soups or stews and are excellent, braised on their own, or, as in this case, with a bit of carrot, bacon and onion. Peel rutabaga (with a vegetable peeler - like a potato) and cut into pieces about 1/2" X 1/4" - you will need a big knife; it's a hard vegetable. Peel and thinly slice carrot. Fry bacon in a medium sauce pan. When crisp remove and drain all but 1 tbs fat. Add onion, celery, and sauté until tender, about 5 minutes. Add rutabaga, carrots, 1/2 cup water and bacon. Bring to a boil, cover, reduce heat and simmer 20 minutes. Test for doneness - taste, should be like a cooked potato. When done, drain any remaining liquid, stir in butter, sherry and serve.